Getting better at managing money may be one of the most common New Year resolutions, but this year it looks like Britons really are taking it seriously. This is because new research from Experian CreditExpert reveals Britons collectively cut the cost of their Christmas by £5.9 billion. 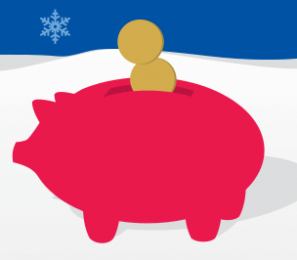 Although the average spent was £511, each of us saved a significant £182 through a little seasonal savviness  and consumers are set to follow this up in the coming year by repaying debt and finding ways to save money on their day-to-day outgoings. A quarter of Britons (23%) are already planning to cut their energy bills and a further 10% will be looking to trim their TV, broadband and phone subscriptions. Indeed, a majority of those who incurred debt over Christmas (56%) believe they will have paid this off by the end of January 2013  a month faster than in 2012, when 5% also still had Christmas debts the following December. Budgeting and financial planning also seems to have been a key difference between Christmas 2012 and the previous year. Although one in four Britons (26%) admits they didn't consciously plan to be more frugal this Christmas, this figure is down from 39% last year. An impressive 38% consciously created a Christmas budget, with the majority either sticking to their budget (36%) or coming in under budget (16%)  up from just 21% and 8%, respectively, last year. And it seems that many people may have been inspired to change their ways after a painful New Year last year. More than two fifths of Britons who went over budget last year (43%) said it made January 2012 a real struggle, with 10% having to borrow more money to make it through the month. As a result, 24% said it made them more determined to budget this time around. If you do one thing this year, make a budget. Knowing what your actual outgoings are  and so how much you really have left over each month  is the first step to taking control of your finances, a free budget planner like Money Dashboard helps you achieve this. Once you know your outgoings, spend an afternoon seeing if you could trim any of your bills. Experian CreditExpert has a unique service that can match credit products to your personal credit history to help you target the best deals you're likely to be accepted for. If you have several credit or store cards, take some time to close down those you don't need or use any more. However, it may harm how you're rated if you regularly use too much of your available credit. Try to use no more than 30% of your overall available borrowing limit and avoid ‘maxing out' any individual accounts. One in four of us doesn't realise that missing card payments will harm your credit rating  and it will stay on your records for at least six years. Make a point of setting up Direct Debits to take care of at least your minimum payment each month. The adult UK population is 47,711,600, 68% of whom made efforts to spend less this Christmas. Adults were asked how much they saved this Christmas through a range of tactics, with the average total being £182. Therefore: £182 x 0.68 x 47,711,600 = 5,904,787,616, or £5.9 billion. Research was carried out online by Canadean Consumer on behalf of Experian CreditExpert among a representative panel of UK adults. 1,834 individuals were surveyed between 19 and 24 December 2012 about their pre-Christmas spending. 1,233 of the same respondents were then surveyed between 2 and 7 January 2013 on their actual spending.